After a year and a group that went from 14 people down to 8, the big day finally arrived – our trip to the Grand Canyon for a hike from the North Rim to the South Rim. Our first day was spent getting from Dallas, Texas to the North Rim. Our flight from DFW airport to Phoenix was at 7:40 a.m., so our son Ted was dropped off at our daughter Rachel’s house where we had spent Sunday night. Rachel then drove the three of us – Monica, Ted and I – to the airport, where we arrived a little after 6 a.m., got checked in and were soon on our way. 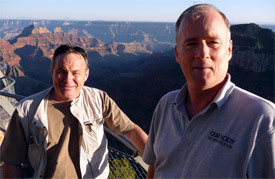 Ted and I pose after our arrival the South Rim. South Rim to the North Rim. scenic overlook on the North Rim. from the historic North Rim lodge. The three of us – Monica, Ted and I – arrived in Phoenix two hours later but only a few minutes later according to local time, since Arizona does not switch to summer time. That was helpful since we needed to be at the South Rim by 1:30 p.m. local time to take a shuttle bus from the South Rim to the North Rim. 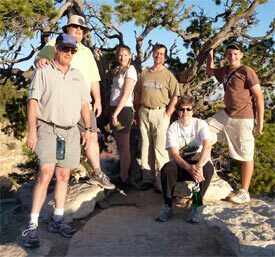 It seems a lot of people hike in the Grand Canyon from the South Rim to the Colorado River and then back up the same way, but we wanted to go from rim to rim, which meant that we had to get over to the North Rim while leaving our rental car at the South Rim. We got our rental car at the Phoenix airport fairly quickly and were soon on our way, making good time. We stopped once just west of Flagstaff, where the interstate roughly runs along the path of old Route 66. 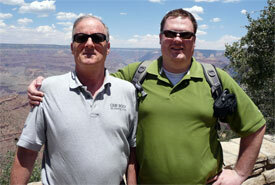 Then it was time to head north again to the Grand Canyon and the South Rim. After about a 3.5 hour drive we arrived at the South Rim, just in time to claim a rare free parking slot right in front of the Bright Angel Lodge where we had to catch the van for another 3.5 hour ride over to the North Rim. The parking location was also ideal for finishing our hike, since the South Rim trail we planned to take ends near the Bright Angel Lodge. We checked to make sure we were at the right place – and we were. Time to refill our water bottles, write a couple of postcards and wait for the call to board the van. Everything had gone extremely well so far. "Serendipity" was Monica’s comment. Since I did not know what that word meant, I could only agree with her. 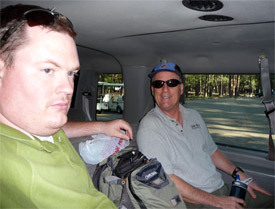 At 1:30 p.m. 13 people boarded a 14-seater van for the 185 mile trip around to the North Rim. When I saw the first mileage marker, I wondered how long it would take. The entire trip is on two-lane highways through mostly pretty dry country. The three of us sat in the second to last row of seats in the van, and the seats were not the most comfortable. We made a couple of stops. One of them was to let some people out who were going whitewater rafting. After they got out we all had a little more space, and Monica moved to the front seat next to the driver since she doesn’t do so well sitting in the back. The driver made good time, and we rolled into the North Rim area about 5 p.m. There to meet us – well, they weren’t exactly standing there waiting for us, but they came up within a minute or two – were the other hardy souls who had not backed out of the trip: Darris McNeely and the Fenchel family: Matt, Lisa, Lynette and Garrett. It was 7 p.m. Dallas time, so we had been en route for nearly 12 hours to get from Dallas to the North Rim – about the same air time it takes me to fly from Frankfurt to Mobile. After a light meal and a first look at the North Rim Lodge and its surroundings, all of us were ready for a good night’s rest.